Rocky (Jane Levy), Alex (Dylan Minnette) and Money (Daniel Zovatto) are three thieves who make their living by breaking into the houses of the few wealthy people left in Detroit. While looking for that "one last score" Money gets word about a blind veteran who won a major cash settlement following the death of his only child. Assuming he is an easy target, the trio invades the man's secluded home in an abandoned neighborhood. Believing the man is asleep they begin looking for the cash only to find the man is awake and not as helpless as he appears. 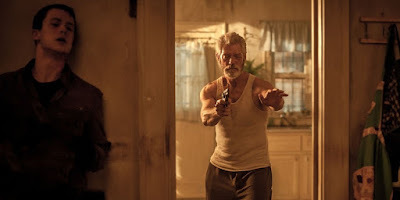 In the land of the dark the blind man is king and that is exactly what Stephen Lang is; King. Lang plays The Blind Man, a combination of Freddy Krueger and Rutger Hauer's Nick Parker from Blind Fury turned to 11. He is cunning, deadly and, most of all, feels robbed by the world. This in turn justifies his actions, at least, in his own mind. Lang takes a character that should be unliked and makes him almost sympathetic in a way. Make no mistake, Lang is the star here and everyone else is just cannon fodder. The only thing the movie is lacking is on screen gore. There is blood and some awesome kills, but as far as unique deaths go, these are pretty average. Considering that Don't Breathe is helmed by the same man from the Evil Dead remake, Fede Alvarez, you'd think the kills would be spectacular. However the pacing, sound design and tension do a fairly good job of making the lack of gore an after thought. Don't Breathe is a solid horror movie that is sure to whet the appetite of many horror fans. As for the average movie goer, they are sure to be sickened, disturbed, scared and grossed out, which is exactly what a horror movie should do.